Okay so January FLEW bye….. we had snow days, and ice days, and hey it might snow but didn’t days…. yikes! I think I saw my kiddos about 3 times in the last 2 weeks! Anywho, it”s time for my February Currently brought you by Farley at Oh Boy 4th grade!! listening – Dozer loves to lay behind my head, like a pillow, and snore loudly in my ear as I have computer time at night. It’s a calming, tranquil sound that I have grown very fond of and I actually sort of miss it when he goes up stairs to hang out with hubs. loving – my birthday was this past Tuesday… the big 3-0. Hubs and I usually don’t exchange gifts, just go out to dinner. However, this year he broke the tradition and bought me a new computer (a much, much needed present!) He bought me a Yoga Ideapad. It transforms from a laptop to a tablet and any position in between in seconds. It’s taking some getting used to for the new Windows 8 operating system…but I’m getting there pretty quickly. I forced myself to make the move no matter how hard it would be by moving everything off my old lap top and putting it in the closet. Three days now I’ve been using the Yoga and it’s definitely getting easier! And it’s SOOOO FLIPPIN LIGHT! thinking – So, little known fact about me – I bake when I get stressed (I worked in a bakery during high school and summers in college – 8 years total!) and yesterday I made 18 red velvet cupcakes with white and dark chocolate chips floating in the middle…so good. I may have just eaten two and I may feel very sick because of it currently! needing – pay day was today so I need to go do my 2 week (haha who am I kidding) grocery shopping excursion tomorrow. It will probably end up being a super bowl party shopping excursion…but that’s fun too, right?! Ahh…. Friday night on the couch….gonna go grab my milk, relax on my “pillow” and discover my yoga a bit more! OMG, I love Dozer! Bulldogs are my favorite. Such a great breed. Baking for others is good, but when it is for yourself the temptation is just staring at you! It is much too hard to resist at my house! I actually took 12 of the 18 to school today… why I didn’t take the other 6, I’ll never know! My colleagues send me recipes to make and bring them…they know me way too well! Happy belated birthday! Mine was yesterday! Found you through Farley’s currently. Enjoy your new computer! Happy belated birthday to you as well! January birthdays are the best! Happy birthday – those cupcakes sound divine! We have a black lab who loves to snore – you’re right it is soothing! 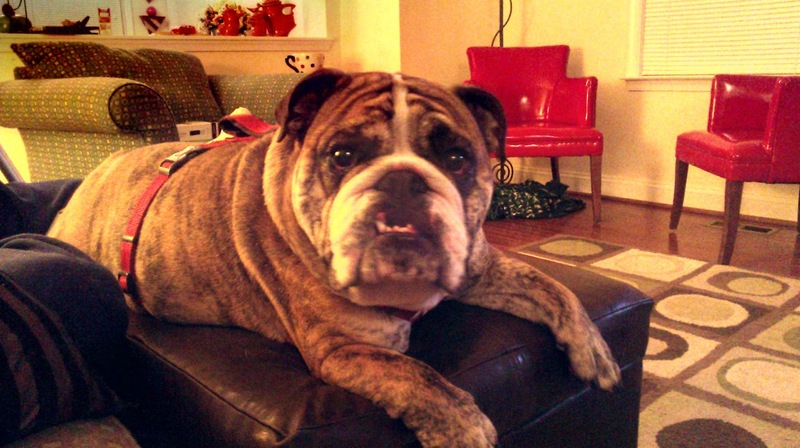 Bulldozer makes me miss my dad’s bulldog, Max. 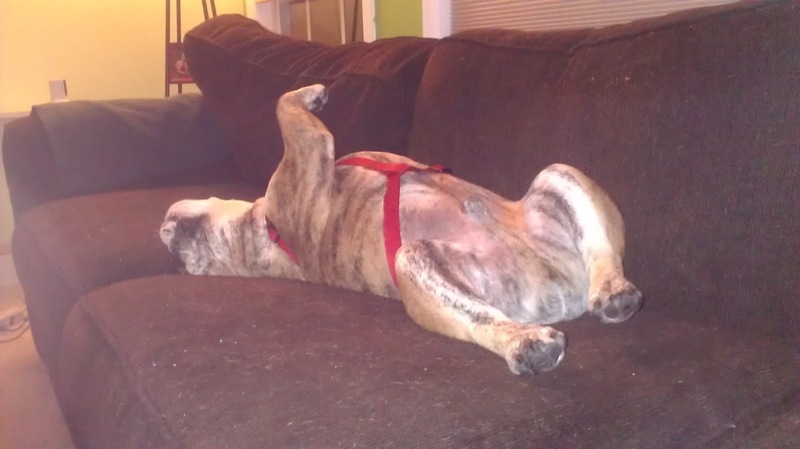 He is a not so lean-mean-snoring machine. Jamie – Dozer is soo cute. I found you through Farley but have seen you on the forums…glad to have followed you now. We have a crazy pug…dogs are great! Hi, Vicky! I’ve seen you in the forums as well – WELCOME! Dozer is my little (okay not so little, but thinks he is super tiny) bundle of love! He makes sure I don’t spend too much time on the computer! To tell me it’s time to get up, he comes over and crawls over my arms pinning them to the laptop so that I can’t function. That’s when I know I’ve been TpTing or blogging way too long! Headed over your way now! Your cupcakes sound awesome and unfortunately, I need to go grocery shopping, too. I have a feeling that it’s going to be a little crazy! Come By and Visit My Blogs! Welcome! Ugh..doctors offices always feel like a waste! I was so glad when mine started handing out a wifi code so I could at least be productive! Welcome! Welcome! Welcome! The more the merrier! I love getting distracted by other people’s blogs! It’s become a bit of an addiction for me! I hope you love what you find and can use some of the ideas! Your dog is adorable! I agree about people wasting others time. Time is the most precious thing a teacher has. Your blog is too cute!! I love it! I’m your newest follower. Thanks for sharing!